Originating authors are Reinhard Oldenburg and Michele Artigue. How do computer packages do abstract algebraic problems such as proving statements “for all ” or finding whether a Real Number with certain conditions exists? Recent advances draw on theorems in mathematical logic, as well as improvements in computing. Since the most ancient times, mathematicians have tried to invent algorithms allowing them to solve automatically classes of mathematical problems. For instance, systematic techniques for solving problems that we model by quadratic equations today, Euclid’s algorithm for deciding if two numbers are relatively primes, were already known more than thousand years ago. However, we also know that a general algorithm cannot be found for solving algebraic equations beyond degree 4, and since Gödel’s incompleteness theoremi that it is impossible to have a procedure for deciding about the truth of all the formulas of any theory containing elementary number theory. The development of mathematical logic and its connection with computer sciences however produced new tools for approaching these questions and substantial advances. This vignette will tell you some pieces of this story. What Tarski developed in the thirties was a method for quantifier elimination for a particular theory, that of real closed fields whose paradigmatic case is the field of real numbers. Doing so, he proved that the truth of any closed sentence of this theory can be decided, but also that sentences containing parameters (as in the introductory example in which is a parameter) can be transformed into equivalent statements in the form of finite sets of conditions on these parameters. However Tarski’s method was very complex and could not lead to a practicable algorithm. More research was needed in order to reach the current stage in which effective algorithms are incorporated in symbolic packages such as Mathematica or Maxima, as shown in the examples below. In the first example, Mathematica is used for finding the values of the parameter for which the function has at least two distinct real roots. First the function is entered using the Mathematica syntax; then an expression is entered, expressing the problem in a formalized way, and finally the Resolve function that eliminates quantifiers is applied to this expression. The result displayed is or . In the second example, the same software is used for finding the values of c for which admits a real root in which the curvature of is positive, that is to say the second derivative of is positive. This time the result is: or . In the third example, the software Maxima is used for deciding about the continuity of the polynomial and the rational function , first at point , then at a generic point . Once again, the continuity of a function at a given point is expressed in a formalized way that translates the definition given above into the Maxima syntax in which the universal quantifier is denoted by and the existential quantifier by . Note that the conditions expressed by absolute values in the usual definition are expressed here using inequalities between squares. Then the function for quantifier elimination is applied to this expression. In Maxima, it is called . It also applies to rational expressions as shown in the example. The answers provided tell us that the two functions are continuous for , but that the second one is only continuous in for . What we have seen in these examples is the application of a method that proves advanced mathematical statements and is even guaranteed to be successful in a wide domain. So, how can computers do so such advanced “thinking”? The language we consider in the theory of real closed fields contains two operations , , an order relation and equality. It also contains two symbols for denoting the respective neutral elements of the two operations. Furthermore there are number constants, variables and quantifiers (by lopez). This is a first order language, that is to say that quantifiers only operate on variables, not on set of variables or function symbols. Even more restrictive is the condition that exponents can only be natural numbers (this excludes for example Fermat’s theorem from being proved in the context of the theory presented here). The axioms of the theory are those ensuring that the structures satisfying these axioms are real closed fields, that is to say ordered fields in which every positive element has a square root and every odd degree polynomial has a root. Within this theory, new operations and relations can be defined, for instance subtraction, large order relationship, and new symbols introduced for denoting them, as well as for denoting particular terms, for instance integers, the inverse of a non zero element or the square root of a positive element. Most elementary sentences are of the form: , , , being a polynomial expression in one or several variables, and their negations , , . • and in which the remaining part is a disjunction of conjunctions . reader to produce such a form for the last example by using the two rewriting rules listed below, and then check the answer by comparing to the one provided in note . When a sentence is in prenex form, multiple quantifiers can be eliminated in turn, starting from the innermost. Noticing that, using its negation, the treatment of a sentence of the form can be replaced by the treatment of the sentence , it finally comes out that what needs to be understood is how an existential quantifier can be eliminated from a sentence of the form in which each is a conjunction of polynomial equalities and inequalities depending on x and possibly other variables. In fact, such a sentence is equivalent to , thus what needs to be understood is how an existential quantifier can be eliminated from a sentence of the form , the being polynomial expressions possibly depending on other variables than . In this vignette, we restrict ourselves to the real number field as the most important case of closed real fields and the most connected to secondary mathematics. Solving the problem of elimination for it means that an algorithm can be developed for reducing the examination of the values of polynomials over the real line to a finite number of cases. Sturm’s theorem and cylindrical algebraic decomposition (CAD) provide a solution. A polynomial in one variable divides the real number line into regions depending on the sign of its value at particular points. There are at most real roots, so these delimitate at most open intervals on which is either positive or negative, the finite endpoints of these intervals being the roots of . While there is no general formula to express the zeros exactly as mentioned above, the number of zeros in every interval can be counted exactly by the method given in Sturm’s theoremv. Thus we can locate the different roots in intervals of arbitrary precision and be sure not to miss any. This is enough for the procedure of quantifier elimination to work. When more than one variable comes into play, we have still a finite number of regions in the variable space where the polynomial at hand has constant sign. For instance let us come back to the first example. 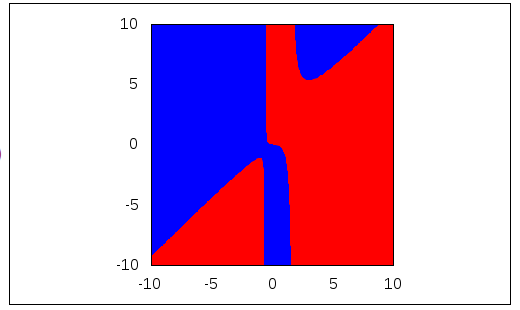 The function can be interpreted as a polynomial in the two variables x and c, and the image below, obtained with the software Maxima visualizes the three regions associated to it in the square of the plane . 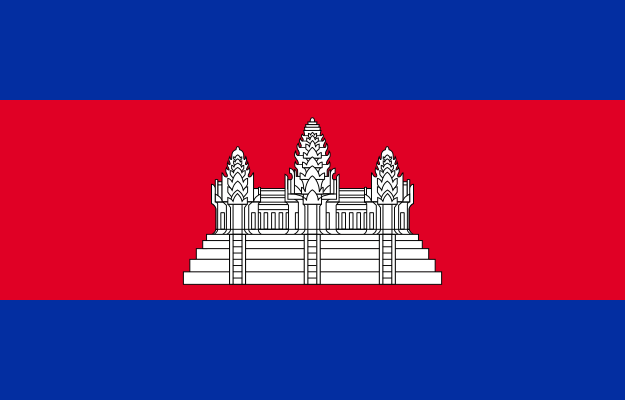 The red color is associated to positive values of and the blue color to negative values of . wxdraw2d(fill_color = red, region(f(x)>0 ,x,-10,10,c,-10,10), fill_color = blue, region(f(x)<0 ,x,-10,10,c,-10,10));[/caption] Similar decompositions can be associated to sets of polynomials. Each region is then characterized by the fact that all polynomials in the set have constant sign in the whole region. The figure 2 below visualizes the regions associated to the previous polynomial and its second derivative on , also obtained with Maxima. respectively associated with the roots of and of its second derivative. However, regions do not have an easy algebraic description even in such a simple case. To make the description simpler, the idea is to split up these regions into smaller cells that are easily described and make systematic computation straightforward. This leads to the notion of cylindrical algebraic decomposition. , , , , with a one dimension cell, and polynomials or rational functions. A cell in dimension is defined in the same way, as a cylinder over a cell of dimension . Projection: Construct a projected set of polynomials in the variables , from the set . Recursion step: Find a CAD for . coordinates into the polynomials of , yielding a set of polynomials in one variable . Determine their real roots and use them to define cells over the cells of . As explained above, for , thanks to Sturms’ theorem, such a CAD can be obtained. If there is more than one polynomial, one just has to take the intersection of the cells calculated for each polynomial. A proof that this recursive procedure works is given in (Winkler, 1996). Let us come back now to the particular examples mentioned above. For each set of polynomial conditions given as an entry, the CAD algorithm produces the cylindrical decomposition of the space associated to the polynomials involved, and returns the cells satisfying the given conditions. 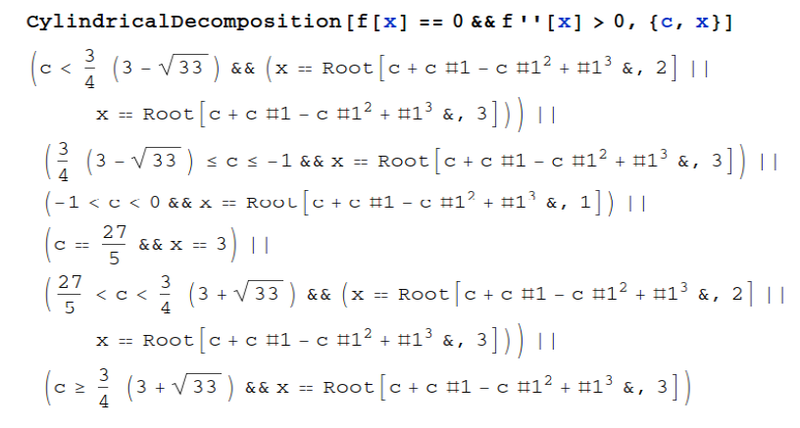 If we use for instance the CAD algorithm implemented in Mathematica with the two conditions and , we obtain the following decomposition in dimension . We invite the reader to check that it fits the definition given above for such a decomposition (intervals with large inequalities can be seen as the union of cells with open intervals and of cells reduced to a single point) and that it algebraically describes the red regions of figure 2 . If we change the set of conditions, looking for the values of for which the polynomial has a real root for which the curvature is positive, we obtain of course different cells. Note that here the variable is in second position in the command used because it is the variable to be eliminated in this problem. The condition makes that all cylinders are of the type where is a one dimension cell and is one of the three roots of the polynomial. This cylindrical structure makes it easy to read off the conditions on for each cell and to combine them for obtaining the final answer: or . Doing the calculations by hand is only possible with toy problems, as the example we detail now. The reader not interested in these details can skip this part. Problem: Find the values of such as the statement is true with and . The projection step of the CAD algorithm amounts to the calculation of discriminants and resultants of polynomials. We do not detail this step here, just give its result, the set . In the second step, we have to produce a CAD for the set . The real roots of the polynomials in are and . 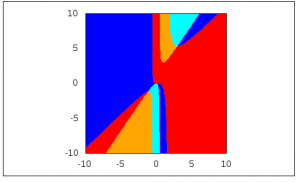 Thus the CAD decomposition associated to is the decomposition of IR into five cells: , , , and . The third step is the extension step. Possible sampling points for D’ are: . Substituting these sampling points for in and , we obtain the following set of pairs of polynomials: . The roots of these polynomials are easy to determine in this particular example. For instance, for the first pair the roots are and . Thus over the -cell we will have the -cells , , , and . Altogether IR is decomposed into cells. Sampling points can now be associated with each of these cells. For instance, for the first five cells corresponding to the -sampling point , one can choose the sampling points and . Plugging these sampling points in the polynomials and , one can sort out the cases in which the two polynomials are positive. Only three cases are found and they come from the first three -cells , , . Thus the quantifier-free formula equivalent to is simply . Quantifier elimination and the CAD algorithm can be used for solving a diversity of problems involving polynomial functions, as many problems can be expressed in the language of closed real fields. These can be algebraic problems but also calculus problems regarding continuity as in the third example we have used, limits, extrema or variations. Moreover, some pre-processing also allows us to handle rational functions as is equivalent to and , and square roots can be replaced in the obvious way: is equivalent to and . Moreover, as was already stressed by Tarski in his seminal work, a decision method for elementary algebra gives a decision method for Euclidian geometry as well. Note that geometrical proofs can be carried out using Groebner bases. These are tools from complex algebraic geometry and allow among other things the systematic solution of systems of polynomial equations – but not inequalities, as the complex number field is not ordered. Thus, not all statements of geometry can be translated in a form suitable for Groebner basis methods and even if they can, the method may say that a proposition is true even if some of the coordinates need to be imaginary numbers and thus the statement does not hold in real geometry. The other way round, a statement may by be true in real geometry but there may be counterexamples involving complex coordinates. The complexity of the algorithms used for quantifier elimination has limited their availability and the computational complexity of CAD has limited its practical usefulness for many years. CAD algorithm is indeed doubly exponential in the number of variables of the polynomials involved. However, due to theoretical (better algorithms) as well as practical (faster computers) advances, the situation has improved, and is still moving, the field being an active field of research. Today, as pointed out in this vignette, CAD algorithms are implemented in many symbolic packages. Different lessons can be drawn from this story. It shows that mathematical logic is not just a meta-mathematical domain dealing with the foundations of mathematics but a domain whose fundamental results have substantial applications in a diversity of mathematical domains. It illustrates the strong connections existing between mathematical logic and computer sciences, and the role played by decision problems and algorithmics in these. It shows the distance which may separate the theoretical proof of the existence of an algorithm from the construction of effective algorithms, the importance of the research work carried out for improving existing algorithms and extending them. It also shows the complexity of the algorithms which can be encapsulated in a given simple command. Secondary students are rarely exposed to the automatic proving of algebra or geometric results. However formalizing a mathematical problem to make it manageable by a computer program is not an exercise without interest even at secondary level. It requires a careful management of the mathematical language, including of quantifications which remain often implicit in the usual mathematical discourse. Moreover, interpreting the results provided by the computer program is not necessarily a trivial task as shown in the examples of this vignette. A. Tarski (1948): A decision method for elementary algebra and geometry. F. Winkler (1996): Algorithms for Polynomials. Springer. St. Wolfram : Mathematica – A system for doing mathematics by Computer. ￼ This is achieved by using the properties of logical connectors, such as those underlying the rules R1 to R5 below. equal to the difference in the number of changes of signs of the values of the Sturm’s sequence at the two bounds of the interval. The Sturm’s sequence of a polynomial is the sequence obtained by applying Euclide ‘s algorithm to and its derivative . , , is the opposite of the remainder in the Euclidian division of by , and so on. As the successive are of decreasing degrees, the sequence is finite, and the final non zero polynomial of the sequence is the greatest commun divisor of and . For constructing this projection, one takes all leading coefficients of the polynomials of when seen as polynomials in the variable , as well as all discriminants and resultants that can be calculated from . , and the values and are the abscissa of the intersecting points of the curves and respectively associated with the roots of and of its second derivative.